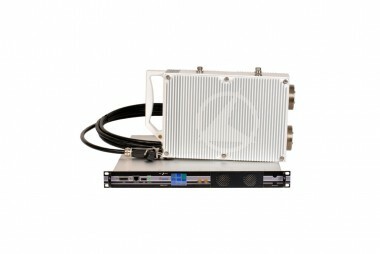 The REBLE610-ODU is the split version of REBLE610 Elber full indoor microwave link, from which it differs for the separation between the RF part (hosted in a waterproof aluminum case) from the modem, the I/O section and control. The indoor unit (or control unit) REBLE610-IDU is equipped with a hot-swappable redundant power supply, available both with AC and DC inputs. The modular approach has brought to the development of the data interface module (hosting modulator, demodulator and data interface) and the ODU communication module (with head supply and optical interface). From an RF point of view, the new transmission circuitry is able to guarantee around 1 Watt with every modulation scheme, introducing, in addition, wideband precorrection (up to 1GHz depending on frequency band). -Integrated hitless switch for 1+1 configuration.